a quilt is nice: adornit giveaway--giveaway closed. I've recently been introduced to a new fabric company, Adornit, and they have graciously offered to give away a fat quarter stack and a coordinating pattern book to one of YOU. I will randomly select a winner on Saturday, May 21st. What cute fabrics!! It's so hard to find good boy prints...and these are wonderful..
i really like the long live vintage line at the bottom. beautiful fabrics! What great fabric! I hadn't seen it before now. Thank you for the giveaway, netti! Love both of these lines. Thanks for the chance to win. What adorable fabric! I love it all! Love the buckaroo fabric. How fun! I love that Vintage groove fabric! It's wonderful! Oooo, love the Vintage Groove! Lovely stuff! Thanks for the chance to win! Vintage groove is definitely my daughters cup of tea - so cute!! Wow, I could really use some of that Vintage Groove. Love the fabric, love the name! Thanks! 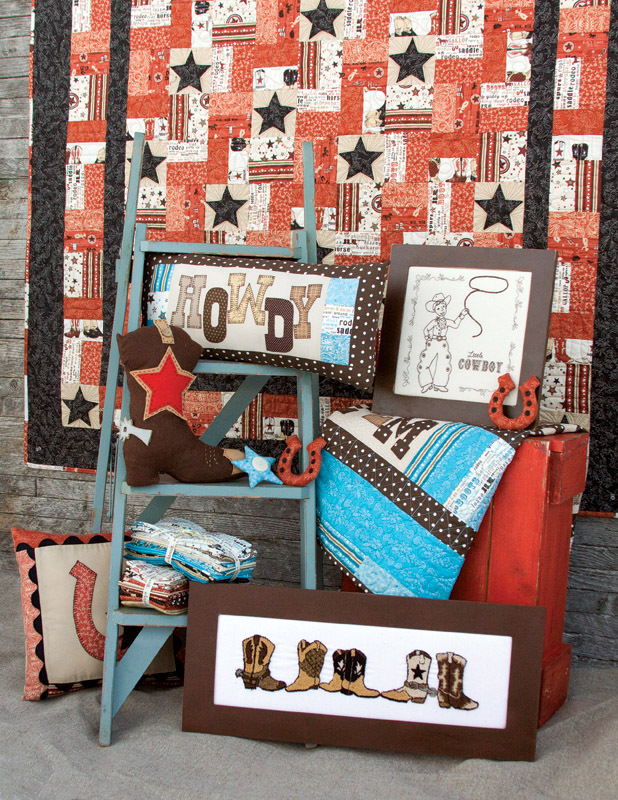 My little boy loves cowboy stuff...that is the most adorable quilt ever! I love those fabrics. What fun they would be to play with. very cute fabrics - I had never heard of those before. I love vintage groove. I made my mom a Mother's Day quilt using a ton of the prints from Adornit and it was hard to part with. So dang cute! Thanks for the chance to play with some of these great lines. I love both of those collections, they are welcome here anytime! The vintage fabric prints are lovely. Beautiful fabric!Thanks for the chance. Love the boy prints......they are the cutest! Thanks. Fun! I never win these, but I just love adornit so I had to try! Their vintage line is so great--I love the stripes with the dots. I love your blog--so many super cute ideas--I don't comment enough on them! Thanks for the giveaway! Wow, I love the vintage groove big polka dots print. From bags to quilts, there is so much you could do with that line! Those would be nice to add to my little stash. Wow! I had never heard of those! Very nice fabric! That's such a cute line of fabric..maybe I'll be the lucky one. As others have said, cute boy prints do seem hard to find - and these are pretty adorable! Thanks for the chance to win! I like Buckaroo. :) Vintage Groove is lovely, too! oooh, thanks for the chance to win! Very generous! I love these fabrics. I love the vintage line! LOVE the Buckaroo...i am adding that to my list of to buys. Great giveaway! Thanks!! Wow! Loving that Long Live vintage line! I love the vintage line! Thanks! That long live vintage line is super cute! Thanks for the great giveaway chance! I like both lines, but Long Live Vintage line had stole my heart! Great boy fabrics! Thanks for the chance to win. how fun! thanks for the chance. . .
What a great giveaway! I love the fabrics. so cute - i love them both, but especially the vintage! thanks! Thank you for the giveaway... love the fabrics. Great giveaway -- thanks for the chance to win. Wow-ee, or should I say Yee-haa! Lovely giveaway, thank you! Very pretty, thanks for the chance! I love the vintage line. I had not seen these before. I love the vintage line! What great fabrics! Thanks so much for the opportunity! I had never heard of adnornit before, but all those collections are so cute! What a great giveaway! What a cute fabrics are this. Thanks for this change. The vintage line is polka-dota-licious! Polka dots are always needed to keep the world happy. You have a great eye for color combinations. I am a beginning quilter and find much to learn from your blog. Keep it up. Love that Vintage Groove collection. Thanks for sharing a new designer with us and for the chance to win! Pretty fabrics! Thanks for the chance to win! So very fun! thanks for the giveaway! Thank you for the giveaway. Beautiful fabrics. I love them. Love the Vintage Groove. Thanks for the chance! Those are adorable! Great find, and thanks for the giveaway! Oh my, I'm officially in love! how nice... and thank you for the chance. Really cute fabrics! Love them! I like that paisley in the Long Live Vintage collection. Thanks for the chance to win some. I like ALL of their new prints! WOW! I can't wait to see these lines in the stores. love it! thanks for the chance to win. Love the bugaboo line do you know who will carry it? Thanks for the chance to win. Love the vintage prints! Thanks for the giveaway! I really like that wavy-stripe pattern in the bugaboo line! Love all things cowboy! So adorable. So cute! They would be perfect for a quilt for my little nephew. Fabrics for boys hard to finde in germany. Growing up on a ranch, I love any cowboy themed fabric. It looks so cute. Thanks or the chance to win! It sure would be fun to play with those fabrics! Ooh, that Vintage Groove is yummy! 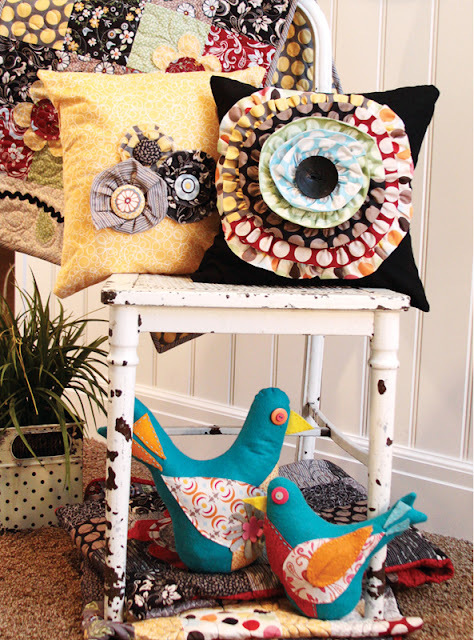 As a novice quilter, I am immediately inspired by your creations. Oh the things I could do if I won... THANK YOU for the giveaway! Wowzers. Love those fabrics. Thanks for the giveaway and introducing us to a new fabric company!! That's gorgeous! Thank you for a lovely giveaway too! So generous! Thanks! I've got my fingers crossed. Cool! I'd never seen these collections before. wow, what great fabrics to work with my for son! cheerful stuff! My sister is pregnant and loves horses; this would be great to make a quilt for her baby! Love AdornIt! They have such cute fabrics. They have been around for a while in the scrapbooking field, so I was excited when I found they did fabrics too. Sweet fabric! Sweet giveaway! So sweet of you! Thanks!! Love the fabrics! Thanks for the giveaway! Wow those are cute fabrics, I'll be checking them out! Buckaroo looks great! Thanks for the giveaway! Thanks for turning me on to a new fabric resource! 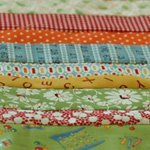 These buckaroo fabrics are sure cute. I would love to win some new fabric. What a cute line of fabrics! That "Long Live Vintage" line looks really cute! I love the Vintage collection! Very nice!! sweet giveaway!! it's hard to select which option I'd choose! I am working on western themed quilts for 2 sets of bunkbeds and that fabric would be perfect! Great fabrics! I can never resist cute cowboy prints! The vintage groove line is great. Thanks for letting us know about them and the chance to win some of the fabric! I really like the vintage. What fun fabrics! Ooh, I LOVE this fabric! Those vintage fabrics are the BOMB! thank you for giving me a chance to win this lovely gift! Oooh! I'd choose the Long Live Vintage fabrics. Thanks for the introduction and giveaway. Oh my! That's beautiful. Thank you for a great giveaway! I hope I win! I am having a little buckaroo, how perfect! What a cute line. A new fav for sure! Great to see such new and unique prints...love both the lines. Thanks for the giveaway! I love hearing about new fabric companies! Thanks for the chance! Love that vintage fabric. Thanks for the give-a-way! Wow - great range - I think these would be great for the oldies as well a little boys! those are adorable...love those vintage ones!! Their fabric is really pretty. Wow these look great! That cowboy line looks super cute, and I'm digging those big polka dot prints and the cloud print. Thanks for the chance to win! How cute....thank you for the introduction to these lines!!! such lovely fabric. I would love to be a winner! I have a new grand-daughter coming who needs a quilt in sweet fabric. Buckaroo, Bugaboo, paisley and polka dots, I'm liking this new fabric company! Oooh, I love the vintage line! Pretty! Beautiful fabrics! I love the vintage line! The Buckaroo would make a great quilt for my sons new "big boy" bed. What a great giveaway. I'm gonna have to try those ruffled flower pillows! These are lovely fabrics, thanks for the chance to win. What a cute line of fabrics. I've never won one of these! Maybe it'll be my lucky day! I really like the Long Live Vintage line. I'm just getting into quilting and need to start putting together my stash! I'm going to use your zigzag tutorial to make my first quilt. If it turns out well I'll send you a pic! My daughter wants a cowgirl quilt. This fabric looks awesome for that. Thanks for the chance! I love the fabrics, in particular the Vintage Groove!!! Love all the little bugs! It would be hard to choose from those two lines. Love them both! how fun - thanks for the chance to win. Both collections look so great! Thanks for sharing your new find. Lovely! Would love to start a new project with these prints! YES! I'm loving all those fabrics! What a generous giveaway! I love these prints! Well those are lovely! Great giveaway! I hope I win! What pretty lines. Nice to finally see some boy style prints. Love that vintage line of fabrics too! What cute fabric...thanks for showing something new and for the chance to win! ooh--long live vintage just stole my heart. Those fabrics are so cute! LOVE the vintage groove line. Oooh, some of that would be great boy fabric! I have three grandsons. I'd LOVE to win either stack of fabrics, either for them or for me! Really, really like this giveaway..someone is going to be SO lucky! I love the vintage line. Thanks for the chance. Oh how wonderful! Ty for the chance! Those are really cute fabrics. Love the buckaroo and bugaboo! Very cute fabric- love both of the vintage lines!